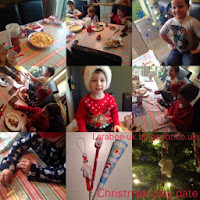 This week, we hosted our annual Christmas play date, we don't go all out for Christmas as we figure that the kids have enough treats and gifts so the 'goodie bags' are generally more modest and the activities a bit more basic because we've all got lots to do at this time of year! We invited T's cousins over for the play date, Jack (J) who's 4 1/2 and Molly (M) who's nearly 5. 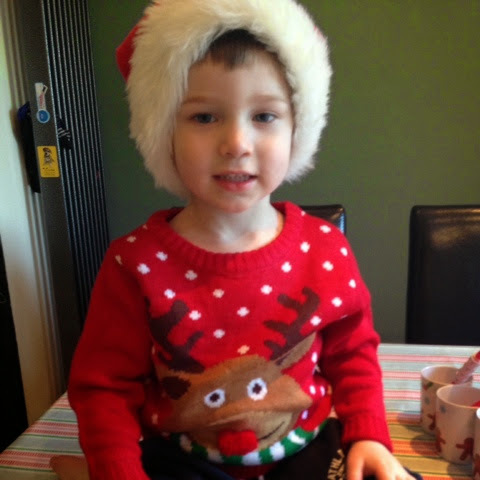 T wanted to wear his Christmas 'jomper' and hat, so we were all ready to greet his guests. 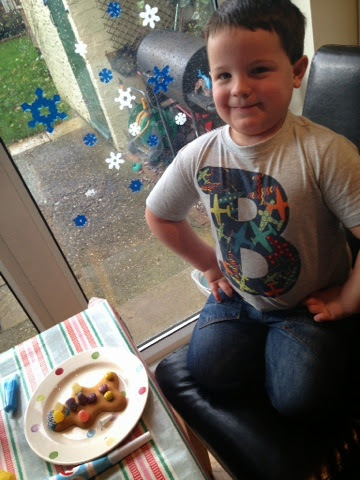 After the film and some lunch, we cracked on with the gingerbread men, J was very proud of his creation. The card making went down very well, especially when I got the 'happy christmas' stamp out! 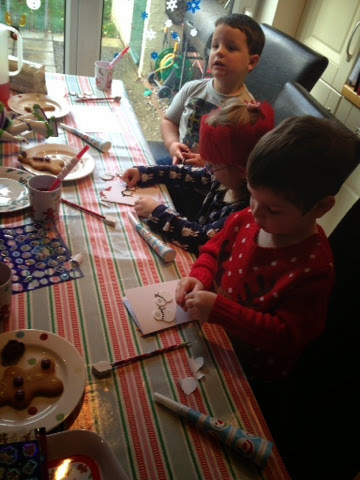 Thank goodness for stickers it makes Christmas cards so quick and simple, and believe me the boys really need quick and simple. M would sit all afternoon making if she could! 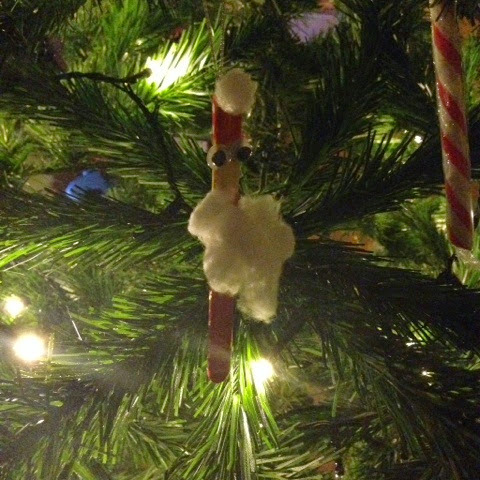 I found these cute ornaments on pinterest, so we made them (although I forgot the buttons!) 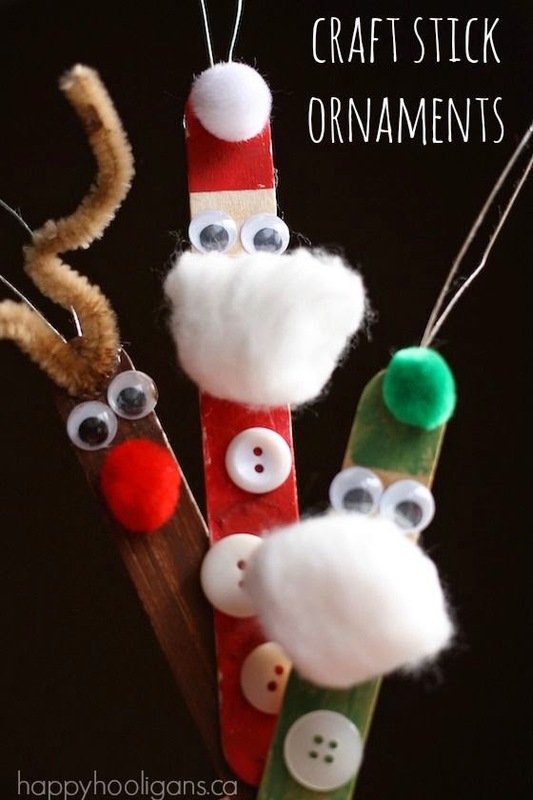 for a simple craft using items from our craft stash this was brilliant, just perfect for the boys. 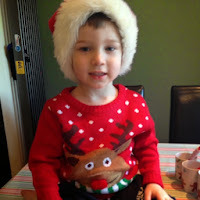 So that rounds up our Christmas play date. A lovely day was had by all and everyone left with a pencil, card, ornament, blower and gingerbread man. look lots of fun! Cant wait for our playdate...just need everyone's sickness to be gone!